Kransekake, also also called Norwegian Wedding Cake, is no ordinary cake. It resembles a tower - which inspired yet another name, Tower Cake (tårnkake in Norwegian). This unusual Norwegian cake is fat-free, flour free and made with almonds. Oh did I tell you? It is yummy. Who doesn't want to serve an elegant dessert? 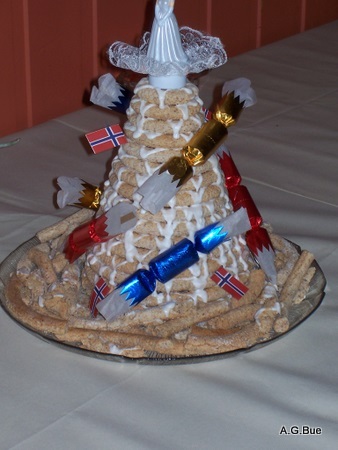 This traditional Norwegian Wedding Cake is served at many other celebrations such as birthdays, Christmas, 17th of May (Syttende Mai), which is Norway’s Constitution Day. Norwegian Wedding Cake is easy to make using special baking molds. Whip egg whites some, but not until foamy. Gradually add powdered sugar and egg whites to ground almonds. Work dough until pliable. Wrap dough in plastic and keep in fridge overnight. It will be easier to work with chilled dough. Sprinkle forms lightly with cream of wheat. Form dough into rolls the size of your finger and place into ring-shaped forms. This recipe will make 18 rings, which is standard. Bake for 20 minutes in middle of oven. Let rest a few minutes before taking cakes out of forms. Mix together and place frosting into pastry decorating bag. Apply as "cement" or "glue" in a zigzag pattern between layers as you build cake. If you want your cake less sweet, use only a few dots frosting on the rings. is used to decorate this cake. How about decorating with flags from your country? Serving Ideas: Cover Serving plate with a lace paper doily and place the cake in the middle. Break the largest rings into pieces first and arrange around cake along with wrapped candies. The Norwegian flags are inserted into the cake. See picture above. You can have fun baking this traditional Norwegian wedding and/or Christmas cake, but you'll have even more enjoyment serving it as you will receive tons of compliments.